This book celebrates 100 years of defence science in Australia, beginning with the role of Cecil Napier Hake in investigating the feasibility of establishing a cordite factory in this country. From those early days defence science has undergone many changes. 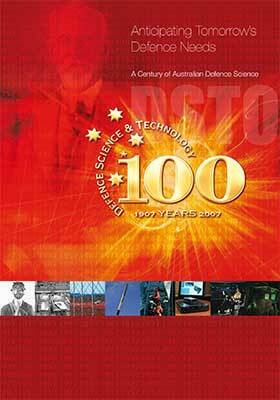 Anticipating tomorrow's defence needs: A century of Australian defence science recounts the development of DSTO (now DST Group) and Australian defence science with an emphasis on people and institutions rather than projects. Generations of Australian defence scientists have been responsible for a host of noteworthy achievements which have helped establish our world class reputation, and many of these achievements are highlighted in this book. It was written by Peter Donovan and published as part of the DSTO's centenary celebrations in 2007.